There will be a Celebration of Life for Mr. Jamie J. Downey, 44, who died Monday, April 8th, on Saturday, April 20th, at the Knights of Columbus in Clayton, from 1 to 5pm. A burial will be held at a later date at the Grindstone Island Cemetery. Jamie was born March 11th, 1975, in Watertown, the son of Ralph and Billie Holloway Downey. He graduated in 1993 from 1000 Islands High School. Jamie attended SUNY Canton for 1 year, then took courses at JCC. He joined the U.S. Navy, where he was a structural mechanic, for the A6E Intruder Air Planes, stationed on aircraft carrier U.S.S. Nimitz. 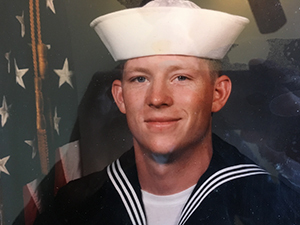 After leaving the Navy, he worked until the time of his death, as a Mason for Mark Doney Construction. Jamie enjoyed golfing, cooking, and watching his favorite football team the Miami Dolphins. Surviving besides his parents, is his brother, Jonathan (Cherie) of Clayton; his maternal grandmother, Wava Holloway; aunts; uncles; cousins; and his favorite nephew, Hunter of Clayton. Donations can be made to T.I.E.R.S., P.O. Box 524, Clayton, N.Y. 13624. So sorry for your loss. Gone too soon. Oh my gosh,he was so young,my condolences. So sorry to hear about Jamie. Our deepest sympathy. Kevin let me know of your tragic loss. My thoughts and prayers are with you all at this difficult time. I have not talked to Jamie in many years, but Jamie and I were good friends years ago (late 1980’s through the 1990’s). I spent summers on Bartlett Point. Jamie was a good friend to me in a town where I really didn’t know many people. He was a good person and we had many similar interests. We had a lot of fun on the river – swimming, boating, fishing, jumping off the lighthouse, being around the river and boats, and listening to music. We also shared a common interest back then in Hydrostream boats, Mercury engines, and high speeds. One of my favorite memories of Jamie was riding around the river in either a 16′ tiller Starcraft or Sea Nymph, trimming the engine out, both sitting in the back seat of the boat, trying to lift the bow out of the water to do wheelies/tailwalk and slowing down to watch the water go over the transom (just like a Hydrostream V-King). We had the same (maybe) weird interests that seemed normal to us. I always remembered Jamie being close to his mom, dad, brother, and grand parents. My sincere condolences go out to his family. They were always very kind to me. Jamie- I’m sorry your gone and I didn’t look you up since those many years ago. Rest in peace my friend. We hope that the care and love of family and friends provide comfort and peace to get you through the days ahead. Our most sincere condolences are sent to all of you. Ralph & Bille: My deepest condolences to your family. May the love of friends and family hold you close at this time. My thoughts and prayers are with you all. Cindy and I cannot imagine the pain of losing a child.